Stop… no go… wait… what? The downtown where I work has had some recent street reconfigurations. Things like changing one-ways to two-ways, eliminating some traffic lights in favor of 4-way stops, adding barrier arms at railroad crossings, and so on. And for the most part I think pretty much all of these are great. I think they enhance access and the flow of traffic. So, you ask, what is there to complain about on a grumpy blog? Yes, you people, Iowa native drivers. These improvements have been in place for well over a year. Plenty of time to adjust. And if you’re new to the area you don’t know about the old. Bottom line: No excuses. Yet I can’t count the number of times where I almost t-boned someone who crossed my street where I didn’t have a stop sign. (There used to be one, but not anymore.) This happened as recently as this past Monday. Then, I get down to the next street, where I do have a stop sign but the cross street does not, and TWO people, one in each direction, stop where there is no sign to do so. One of them just sat there and even waved to me to go. “Iowa nice” does not work well on the roads. Please, I implore you to be just a little aggressive (and competent). Traffic overall will flow much easier if you just do it… and pay attention to signs and stuff. 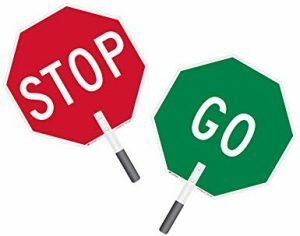 I feel like a “GO” sign at some of these intersections would help greatly. Seems some people need to be told. “I’m done!” Are you, really? Rant: Are you honestly surprised? Missy on Rant: Are you honestly surprised? If you absolutely must contact me, for now you can email me at grump -at- kurmudgeon dot net … but I can’t guarantee I will read it.